Though not a complete reality, artificial intelligence is impacting our everyday lives. In this three part article discussing the impact on industry, marketing and SEO – let’s first define what exactly is Artificial Intelligence? Artificial Intelligence, or AI is the theory and development of computer systems able to perform tasks that normally require human intelligence, such as visual perception, speech recognition, decision-making, and translation between languages. AI works by combining large amounts of data with fast, iterative processing and intelligent algorithms, allowing the computer software to learn automatically from patterns or features in the data.The term artificial intelligencewas coined in 1956, and in the 1960’s the US Department ofDefense started training computers to mimic basic human reasoning. Most uses of AI rely heavily on deep learning and natural language processing (NLP). Using NLP, computers can be trained to accomplish specific tasks by processing large amounts of data and recognizing patterns in the data. Some argue that AI is here to replace humans. But that’s not the intent of artificial intelligence. AI is focused on augmenting our human abilities and making us better at what we do. Artificial intelligence algorithms learn differently than humans learn and AI systems are very, very specialized. They are typically focused on a single task and are far from behaving like multi-tasked humans. How is Industry using AI? 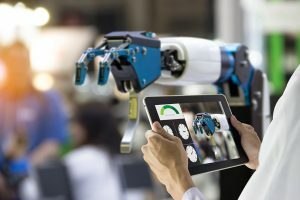 According to SAS, a global leader in analytics, every industry has a high demand for AI capabilities – especially industries where question and answering systems can be used for legal questions, patent searches, risk notification and medical research.In their research, SAS evaluates five specific industry segments and how AI is impacting these industries. These include health care, retail, banking, government and manufacturing. Health Care: AI applications can provide personalized medicine and X-ray readings. These assistants can act as life coaches, reminding you to take your pills, exercise or eat healthier. AI also helps empower physicians with more accurate diagnostics and targeted prevention capabilities, as well as ensure drug safety and control costs. Retail: Through natural language processing, AI provides virtual shopping options that offer personalized recommendations using tools such as chatbots. It allows consumers to connect and discuss purchase options 24/7. It also allow retailers to tailor to specific customer segments, optimize pricing and optimize inventory and fulfillment for in-store or online purchases. Learn more – AI’s impact on retail. Banking: AI enhances the speed and effectiveness of human efforts. AI can be used to identify which transactions are likely to be fraudulent, provide accurate credit scoring as well as automate what were once laborious intense data management tasks. For more information on how the banking industry is being impacted by AI, refer to the article by TechEmergence in their comparison of America’s top seven banks. Government: AI helps with fraud detection by teaching systems to detect outliers in data or match data against known patterns. AI supports national defenseusing predictive maintenance to ensure mission readiness, as well as safety and response agility. And, AI makes smart cities smarter by providing big data analytics helping agencies to better understand citizen needs and provide local solutions that address them. Manufacturing: AI is perfect for manufacturing. It enables manufacturing to automate complicated tasks and find actionable signals in data that in the past was too large or complex to tackle. Quality control, design time, and materials usage will all be improved – as well as providing predictive maintenance for equipment. AI provides automation and removes the factors of potential human error. It’s true – the learning that artificial intelligence does is only as good as the data it collects. Artificial intelligence will impact and change every industry, but there are limits. AI learns from data. If the data collected is inaccurate or misleading it will be reflected. As industries evolve in their application of AI, AI will grow and augment the skills of those who capitalize on her attributes. In part two of Artificial Intelligence – Impact on Industry, Marketing and SEO, we’ll look at the growing interest for marketers in Artificial Intelligence. Pamela Abeyta is the creative maven for Abeyta Design Group. Abeyta Design Group will help with your brand development, off-page marketing and creative environmental graphic design needs. Need help? Say Hello! Abeyta Design Group.